Next up in his sights: 755. 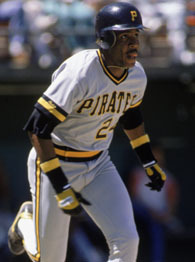 Back in 1988, Bonds hit 24 home runs for the Pirates. Here is the complete list of Barry Bonds' home runs since 1999 -- including the 83 we took away from his career total after our analysis. 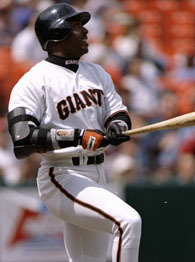 In his first year with the Giants in 1993, Bonds won his third MVP award, hitting .336 with 46 home runs. • Complete Angry Blogger FAQ. 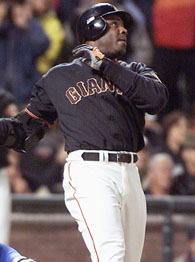 In 1998, Bonds hit 37 home runs -- 33 fewer than Mark McGwire. 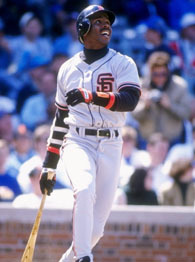 In an excerpt from "Dingers: A Short History of the Long Ball", Peter Keating explains that Bonds dominated his league like no player in history. 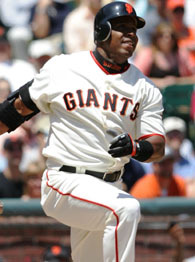 Bonds cracks his record 71st home run in 2001.